To regulate competently the various sectors of the gaming industry that fall under the Authority by ensuring gaming is fair and transparent to the players, preventing crime, corruption and money laundering, and by protecting minor and vulnerable players. The Malta Gaming Authority (MGA) is considered to be one of the top global remote gaming regulators and enjoys a strong worldwide reputation within the gaming industry. The remote and land-based gaming industry in Malta is considered to be one of the major economic contributors alongside financial services, where Malta holds a high degree of reputation. With a portfolio of around 450 remote gaming licenses and 280 companies, the Malta Gaming Authority is a role model for other jurisdictions due to its excellent track record, experience and transparent regulatory regime. The MGA is responsible for regulating all types of gambling and gaming activities including national lotteries, bingo halls, casinos, gaming parlors and remote gaming. The MGA’s regulatory philosophy, organizational principles and culture are focused on player protection. Malta’s transparent legal framework and experience in regulating gaming has developed into a world-class eco-system providing effective, innovative and efficient regulation. Its regulatory framework provides assurances, both locally and internationally, that fairness and transparency are at the core of everything that we do. To this effect, MGA’s licensees are associated with the highest levels of integrity and efficiency. The Malta Gaming Authority is committed to doing what is right and honorable. We set ourselves high behavioral standards and aspire to meet these standards in all aspects of our lives, be it at work, at home, and in the course of our professional duties. Our Code of Ethics articulates the ideals we aspire to as well as the behaviors we deem are mandatory when assuming our professional roles. The purpose of this Code is to instill public confidence in our work, both as individuals as well as an organization in our endeavors to be recognized as a reputable and professional regulatory authority. Public trust, consumer confidence and respect require that we conduct ourselves with integrity in our regulatory role. We believe that we can advance our profession, both individually and collectively, by embracing this Code of Ethics and Professional Conduct. We also believe that this Code is an important guideline in our decision-making process, particularly when faced with difficult and potentially compromising situations which put our integrity and values to the test. This Code of Ethics and Professional Conduct applies to every employee of the Authority. Members of the non-executive board are appointed by the Minister for the Economy, Investment and Small Business (MEIB) for a maximum period of three years. 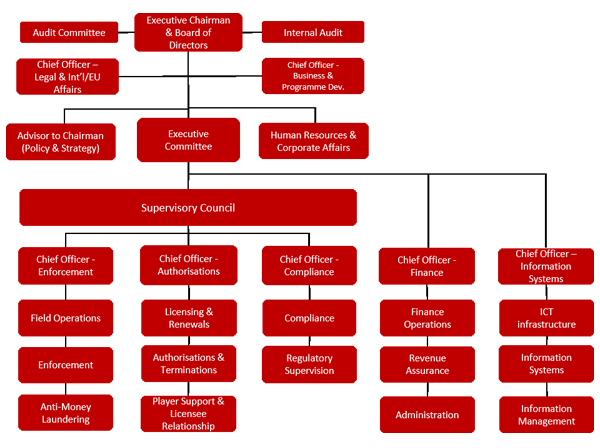 The board is primarily responsible for overseeing the strategic development of the authority and ensuring that the set policy and strategic objectives are achieved. The board is also responsible for policy development and overall risk management. It is also consulted on matters of policy by government. Prior to the re-branding exercise establishing the Malta Gaming Authority (MGA), the Authority was known as the Lotteries and Gaming Authority (LGA).